Tull’s Legendary Pictures is developing a feature film about the life of Jimi Hendrix, whose performance of The Star-Spangled Banner remains one of the seminal moments of the Woodstock Festival which just celebrated its 40th anniversary, according to Variety. The move comes as Sony Pictures Classics widens its release of the Tull-conceived and produced documentary “It Might Get Loud,” which was directed by Davis Guggenheim and stars guitar icons Jimmy Page of Led Zeppelin, U2's The Edge and Jack White of the White Stripes. The script for the Hendrix film is being written by Max Borenstein, who wrote “What Is Life Worth?,” a fact-based script about a attorney Kenneth Feinberg and his work on the 9/11 victims compensation fund. The script made The Black List, but was not sold because of rights issues. 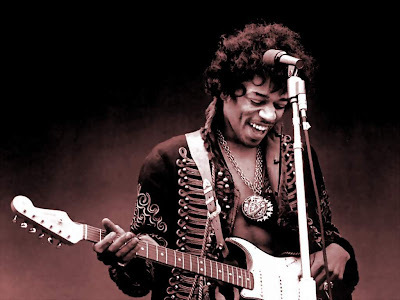 Like picture projects involving musical icons like Janis Joplin and Miles Davis, there have been numerous rumored attempts to make a Hendrix film, with the names of musician-actors like Lenny Kravitz and Andre Benjamin floated. No one has yet locked down rights with Experience Hendrix, the estate which is run by the late musician's stepsister Janie Hendrix. Legendary has been in loose discussions with the estate, but there isn't yet a firm rights deal that will be needed to access Hendrix’s singular sound and guitar wizardry. Legendary’s plan is to develop the project first.